Chiloxanthus pilosus is confined to saltmarshes where it occurs on muddy silt or muddy sand with a sparse covering of plants, which in at least one site included Salicornia, generally on the middle to lower marsh. It has been recorded on patches of bare mud in the Juncus zone of a marsh in Dublin Bay (Speight 1980). Little is known of the ecology of C. pilosus, but is likely to show similar adaptations to its habitat as S. palustris, described by Brown (1945) (although then considered a dark form of S. pallipes), which is able to tolerate submergence by sea-water in both nymphal and adult stages, the nymphs being more tolerant of submergence than the adults and found in greater numbers at lower levels. The pilose cuticle of the adult probably aids the retention of air on the body surface when the insect is submerged. Adults are found from May until September and those found after mid-July are probably the new generation. There is no information on the overwintering stage but as adults are found in May it is possible they have overwintered. Saldids often hibernate some distance from their summer breeding sites (Stock & Lattin 1976), so in the case of C. pilosus this may be in vegetation or litter well beyond the littoral zone. 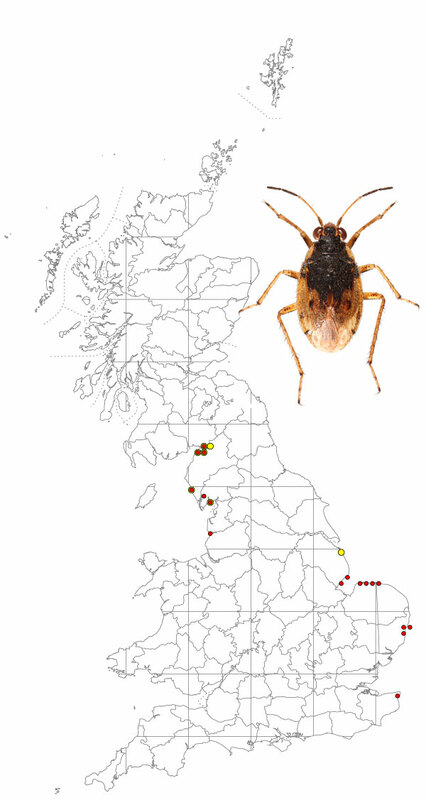 Chiloxanthus pilosus is a very local species recorded recently only from limited areas on the east and west coasts of England. Although this apparently disjunct distribution could be due to under-recording, other saldid species found in coastal habitats, including saltmarshes, have been recorded from many areas outside these two regions since 1989. Saldula pilosella, for instance, has been recorded along the south coast from Kent to Devon. It is unlikely that recorders searching for coastal shore bugs would miss C. pilosus as it is a relatively conspicuous species. There is some evidence for a contraction in range in the UK, based on older records for South West England and for Dublin Bay. On the above map yellow dots show pre 1990 records, reds dots 1990 – 2015 records and red on yellow dots overlapping records. There are post 1989 records on the east coast for Lincolnshire, Norfolk, Suffolk and Kent and on the west coast for Cumbria and Lancashire. According to Southwood & Leston (1959) there are older records for Durham, the Bristol area and the south coast of Devon. C. pilosus has been recorded in Ireland and also occurs in the Netherlands, around the Baltic coast and extends into northern Asia, but has apparently disappeared from France and Belgium. The UK is on the western limit of its range. Because of its restricted distribution and potentially threatened habitat C. pilosus has a status of Near Threatened (as defined by IUCN guidelines). Historically large areas of saltmarsh in the UK have been reclaimed for agriculture; for instance, along the North Norfolk Coast in the region of 50% of the original marsh has been isolated by embankments and converted to either grazing or arable land. Such large-scale schemes are now rare, but smaller areas are still lost to industry, port facilities and other developments. The main current threats to saltmarshes are rising sea levels and erosion, both consequences of climate change. One-third of the area of saltmarsh in England is concentrated along the east coast between North Lincolnshire and the Thames estuary and it has been estimate that up to a third of this will be lost by 2050. As sea levels rise coastal habitats are increasingly ‘squeezed’, either against naturally rising ground behind the shoreline or by man-made barriers. The increasing frequency of severe storms, apparent over the last decade, has also had a destructive impact on coastal habitats. Identification of C. pilosus is relatively straightforward. Only Chiloxanthus pilosus and Halosalda lateralis, among the shore bugs found in the UK, have yellow margins to the pronotum. Both are saltmarsh species and can be separated on the basis of size (C. pilosus being larger, 5-6 mm), lenght of pubescence (longer in C. pilosus) and the number of cells in the membrane (4 in H. lateralis, 5 in C. pilosus).